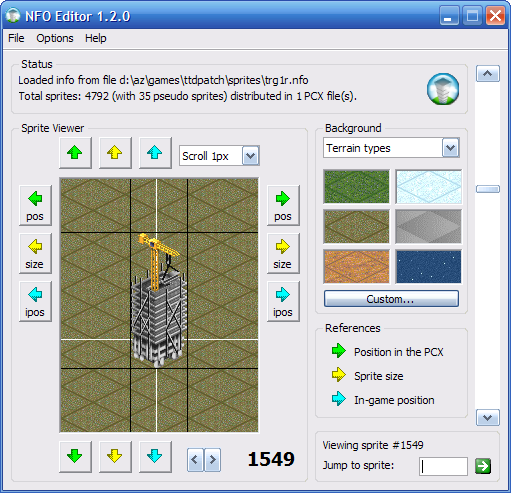 NFO Editor screenshot from Windows XP. The program will only load NFO sprites decoded with the original GRF Codec (0.9.10) created by Josef Drexler (+GRF Wizard), and refuses to load sprites created with the GRF Codec developed by the OpenTTD team. This program has a discussion topic here in the tt-forums.net. Feel free to post any feedback and suggestions there. Sprites cannot be X or Y-positioned on values lower than 0px. This fixes crash when moving outside sprites outside PCX position. Program no longer crashes when opening sprites from an NFO with no PCX on the specified path, an error is shown instead.